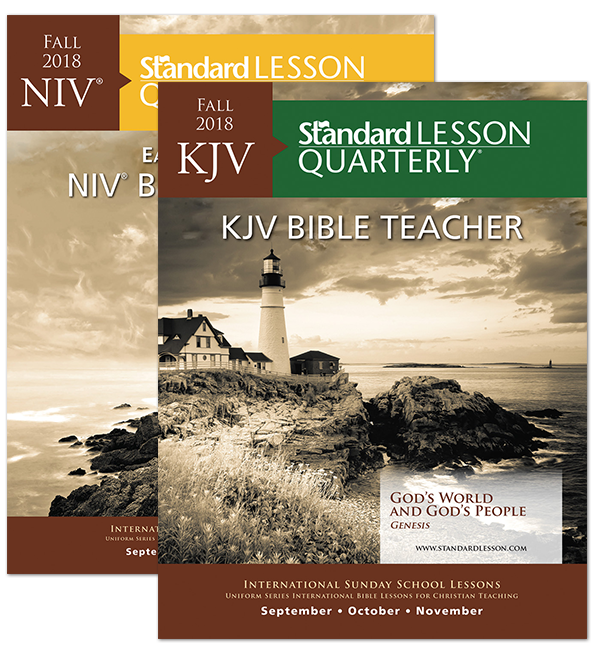 Trusted by church leaders for over 100 years, The Standard Lesson Quarterly® provides quality, biblically sound lessons. Each quarter contains 13 weeks of lessons, including ready to use resources to enhance Bible study for teachers and students. Available in the NIV ® and KJV. A Sunday school class or Bible study group utilizing the Standard Lesson Quarterly will be ready to explore the Scripture text in a way that meets the needs of all kinds of learning styles. Includes the large print teacher guide, a resources pack, one large print student book, one set of Seek®, and also includes a Devotions® book. Available in NIV® and KJV. Bible lessons are easy to prepare and include lecture, discussion, and activities for an effective lesson. NIV® and KJV available in regular print and KJV available in large print. Designed so students have Scripture exposition and learning activities to help them understand the week’s lesson. NIV® and KJV available in regular and large print. Each issue includes articles, stories, and a devotion related to each week’s lesson. Sold only in packs for 5 students. Provides a daily Scripture reference, meditation, and song to prepare for the upcoming lesson. Available in regular and large print. Adult Resources includes engaging visuals, along with a CD that includes PowerPoint® presentations for each lesson and reproducible student pages.